Known collectively as the “Dunk and Egg” books. 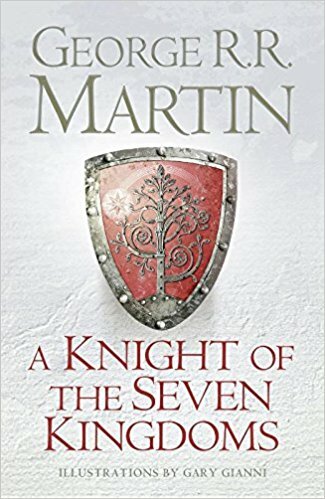 Sitting waiting for the finale of this season of Game of Thrones this week, I was sorely tempted, yet again, to start the series of books that it is based on for another reread. This is a definite mistake as even after getting rid of around 150 books this summer, there is still nearly 1,500 in my room. But Martin could not stray too far from my mind, and so I turned to this compilation of the novellas he has written based in Westeros. Dunk is a seven foot tall hedge knight, who finds himself entangled with the precocious Egg, a little prince who wishes to be his squire. They compliment each other perfectly – tall, strong and slow Duncan, and small, wily and clever Egg. Told over the course of around three years, these stories serve as a peak into the world of Westeros through events that whilst not quite normal, still are not as earth shattering as some of those we are seeing in the show at the moment. Where this all becomes really interesting is that they are set around a century before the events of A Game of Thrones. There are namechecks going both ways between the two, and an understanding of post dragons (and, I guess, pre-dragons) Targaryen rule is thoroughly interesting. My only gripe here is the illustrations. They seem to be a reason to excuse a new printing of this, but I do believe that it is the only stand alone version of these three stories, so that would have sufficed. Instead, they are a distraction that is not really needed – anyone reading these is probably able enough to use their own imaginations. If you are new to the work of George RR Martin – and I mean the books, not just the TV show – then this is not the place to start I would say – just fling yourself full on into the main series. But for those of you craving some more Westerosi action whilst you wait for the next book in the series to come out, you can do far worse than this.